The situation is under control and the airport is safe, the military police say. No other injuries were reported. A police spokesman told AD newspaper there was no assumption of a terrorist motive. 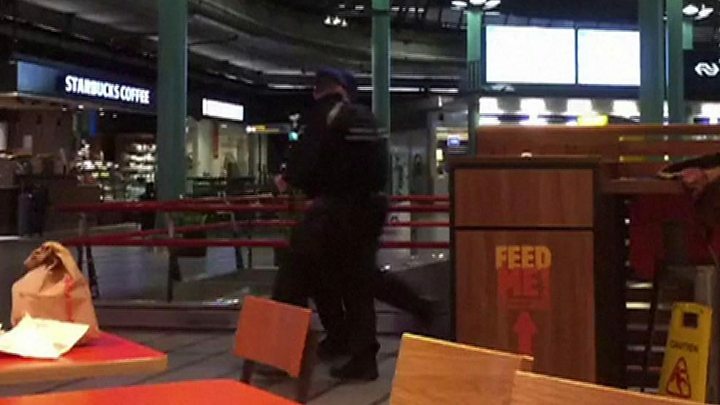 "This afternoon a man came into the office of the Marechaussee [military police] here at Schiphol and threatened my colleagues with a knife," a police spokesman told AFP news agency. "He was shot in the leg and taken to hospital in Amsterdam." The airport and Schiphol Plaza are open to the public. Air traffic has not been affected. Schiphol is one of Europe's top five busiest airports and handled more than 60 million passengers last year.